As soon as we were back from Sacramento we jumped into preparations for our first REALLY big show, “It’s Today!” at the newly completed Oxnard Auditorium. 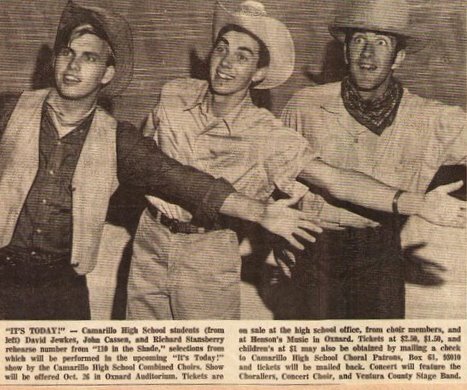 Since Mr. Henderson never did anything in a small way, I’m sure he was just chomping at the bit to have us perform in the newest and most up-to-date facility in Ventura County. And what better excuse did we need than that we had to earn and pay back the money that had been borrowed to finance our trip to the California State Fair? 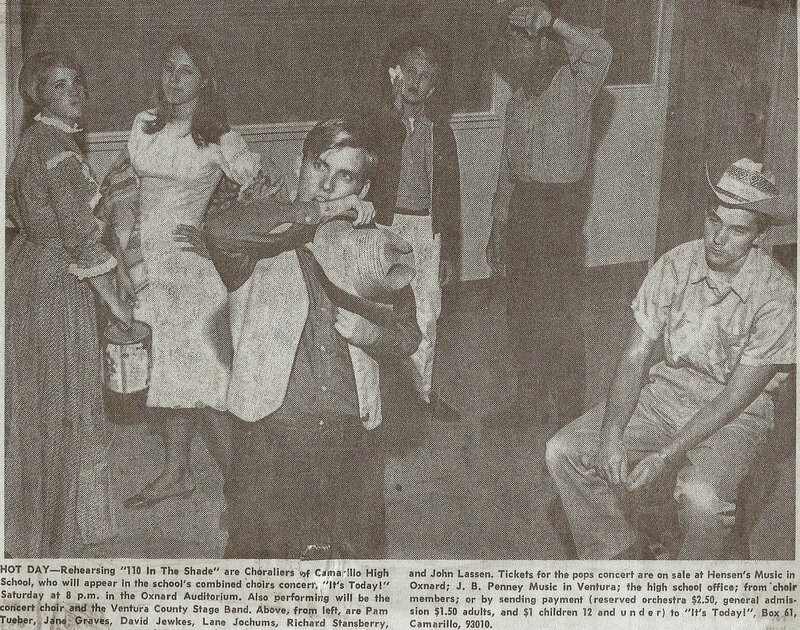 At the steep price of $2.50 per ticket, how could we not earn back all we had borrowed, even after paying for the use of the auditiorium, technicians, costumes, publicity, programs, and professional orchestra? I know… I’m sure we ended up much further in debt after this concert than before. But for us and our audience – it was all about the show. It was incredible to have such a big stage to perform on after having to squeeze onto makeshift stages at the high school and other places . We took full advantage of the space. 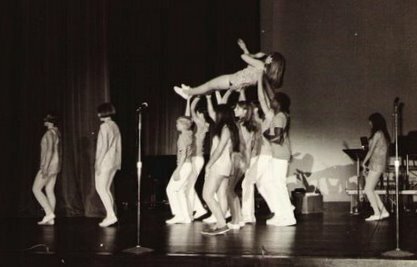 This photo is taken near the end of the song, as Carol Farrington is being carried off while doing karate chops in the air. Don’t ask. Some things just can’t be explained. The paper dresses, however, provided one of my funniest memories of those times. While we were rehearsing in costume at the auditorium, Dennis Wilkerson was testing a variety of lighting possibilities to go along with the song. We girls were on stage, concentrating as always, trying to get our dance steps as perfect as possible. 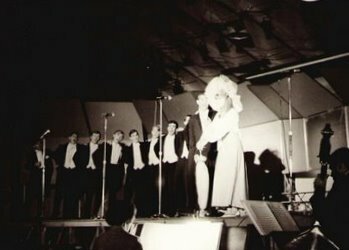 All of a sudden we heard hysterical laughter coming from those folks in the audience – technicians, Mr. Wilkerson, Mr. Henderson, members of the orchestra. We had no idea what was happening but continued to be the professionals Mr. Henderson had taught us to be; dancing and finishing the song. It turned out that while testing lights, Dennis had inadvertently discovered that ultraviolet lights rendered the paper dresses invisible, and the net effect was of little white undies dancing across the stage. Thankfully – and not surprisingly – Mr. Wilkerson decided to use different lighting during our actual performance. The finale of It’s Today was Hello, Dolly! 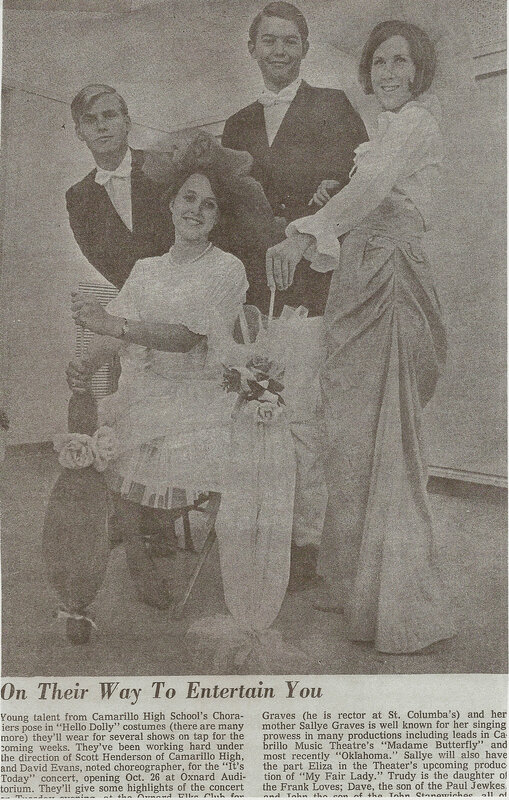 which featured the guys and Carolyn Farrington, as Dolly. 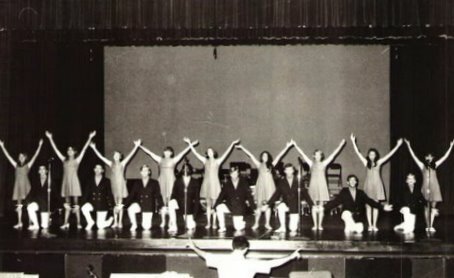 This photo is from an encore performance at the high school and not from the It’s Today! show. The number was a the perfect ending to the show, with the guys doing a fabulous job, and so handsome in their black tail tuxedos. The girls joined them at the end for a “wow, oh wow” finish. Click here to see the performers and program for It’s Today! 1 Response to It’s Today!